It’s 5:30. My boyfriend Timmy and I realized we’re starving. I mean, it’s been a whole three hours since we last ate! There’s nothing good for dinner at the dining commons (the DC) and we don’t feel like going out. So what are we gonna eat?! I looked in my cabinet and found cereal, Ramen, some tea bags, oh! A box of couscous – the name so nice you say it twice. Conveniently, I had taken some spinach and tomatoes from the DC at lunch. The problem is, Timmy has never had couscous before and wasn’t sure if he liked it. Well, this is what I’m cooking and if he doesn’t like it he can starve … or get some Subway. Whichever. Note: If you’re making this for two, I would suggest getting two boxes of couscous. Follow the directions on the couscous box: bring 1/2 cup of water, 1 tsp of butter, and the contents of the seasoning package to a boil. While the water is boiling, cut the tomatoes in half and tear up the spinach leaves. Add couscous to the boiling water, and remove from heat – let sit for five minutes. 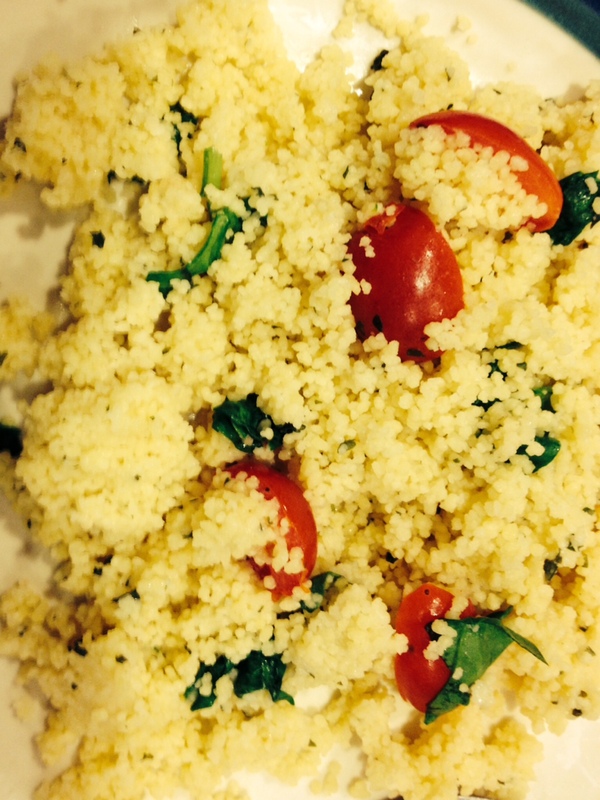 In the final two minutes of letting your couscous sit, add the tomatoes and spinach. For improvising, this turned out to be absolutely delicious, filling, and very budget friendly. Boxes of couscous are usually around $1 each. And, if you take the tomatoes and spinach from your school cafeteria, it’s even cheaper! If you don’t though, at least grape tomatoes make a healthy snack! I don’t think tomatoes and spinach cost too too much! Timmy ended up loving couscous, by the way, so I didn’t have to starve him 😉 He even wants me to make it again! I think next time I make it I’m going to try the Mediterranean curry flavor, since it’s the best one. Try this for yourself sometime and let me know how you like it! It’s a healthier alternative to the typical Ramen noodles and Easy Mac, and it tastes a lot better.